Okra, commercially known as ladies' fingers is most commonly found in South Asian regions. This versatile vegetable can be used to make many tasty dishes. It can be grilled, fried, and pickled too! But, it doesn’t end there. Being micronutrient and fiber-rich Okra provides major health benefits. With a low-calorie (30 kcal/100 g) and high fiber (9%) content, okra is appropriate for weight loss. 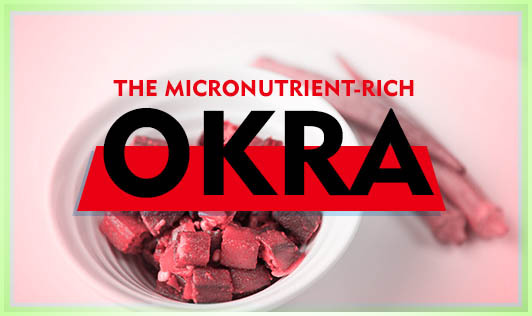 Okra is comprised of the soluble fiber pectin which aids in lowering bad cholesterol (LDL), thereby preventing atherosclerosis by eliminating fat deposition in the arteries. Okra contains folate. Folate assists not only in conceiving, but also helps in the formation of neural tubes in the fetus and prevents the chances of miscarriage. Due to this reason it is considered as an absolute essential food for pregnant women. One of the major advantages of ladies' finger is the fact that it provides vitamin C and calcium which in turn improves immunity and makes the bones stronger. Over all ladies finger is a very healthy vegetable that helps in fighting heart disease and improving immunity. Fortunately, it is perennially found in India!